GTrack is from now on available under the CC BY-SA 4.0 licence, and developed in its new GitHub repo. This makes the whole BioXSD|GTrack family of formats licensed under the same open licence, and evolving using transparent and participatory open development. It has been confirmed that ELIXIR Norway will further develop and deliver BioXSD and GTrack as a family of interoperable data formats and supportive tools. The family of interoperable generic data formats for bioinformatics and genomics comprises BioXSD, BioJSON, BioYAML, the tabular GTrack, binary tabular BTrack, and the integrative GSuite, with supportive conversion tools under development. The aim is to provide a selection of generic, mutually loss-lessly convertible formats suitable for various usage scenarios, such as providing tools, APIs, web apps, or databases, or integrating bioinformatics|genomics data. BioXSD is a construction site again. Current developments focus on employing XML Schema version 1.1 and JSON Schema, and enabling BioXSD to function as a single data model with multiple choices of tree-based exchange formats (serialisations). Highest on the priority list is adding JSON and YAML as serialisation alternatives to XML, and implementing smooth interoperability between BioXSD, BioJSON, BioYAML, and GTrack (the unified tabular format for sequence features). The next stable minor release of BioXSD 1.1, version BioXSD 1.1.3, was released on the 15th of May, 2015. As all minor releases of BioXSD are compatible with all previous and future minor releases within the last major version/namespace, the BioXSD 1.1.3 is "backwards and forwards compatible" with all BioXSD 1.1 data instances (i.e. less restricted than the previous versions, and extended with non-mandatory new attributes/elements). For the list of changes, please refer to the CHANGELOG in the BioXSD-1.1.xsd file. Developments towards BioXSD version 1.2 (the next major, "backwards incompatible" release) are ongoing in parallel, currently in a pre-implementation stage experimenting with essential design decisions. The 1.2 developments at the moment focus on interoperability with JSON, GTrack, JSON schema, BSON, EXI, RDF (and potentially later also other Semantic Web formats, AVRO/Hadoop, RELAX NG or other alternative schema languages), with the PROV provenance metadata, and migration to XML Schema version 1.1. BioXSD 1.1 is now available under a CC BY-SA 4.0 licence! Please note also the new Code of Conduct, outlined in BioXSD-1.1.xsd. In addition, we finally started the long-desired transition to the new source-files repository at http://github.com/bioxsd/bioxsd. We believe that this will bring more transparency to the developments and maintenance of BioXSD, and decrease the friction for participating in the future evolution of BioXSD and related software. We are improving the provenance metadata in BioXSD, by implementing a rich but simple model that will be aligned with the W3C PROV standard. It will most likely be part of the next minor release. Thanks shall among others be sent to the OpenBio Codefest 2013 for input and discussions. For desired additions into the next release, please contact developers@bioxsd.org. A minor release of BioXSD 1.1, the version BioXSD 1.1.2, was released on the 13th of May, 2013. As all minor releases of BioXSD are compatible with all previous minor releases within the last major release, the BioXSD 1.1.2 is backwards compatible with BioXSD 1.1 data (i.e. less restricted). Volunteers are still warmly welcome to join the 50 BioXSD-compatible Web services challenge! The aim is to provide compatible Web services and other tools that adopt BioXSD as one of their input/output formats. Implementations have already been ongoing at CBS in Greater Copenhagen (Denmark), Rostlab in Greater Munich (Germany), IBCP in Lyon (France), CBU in Bergen (Norway), and at a couple of more sites. For more details, help, and consultation, please contact support@bioxsd.org. BioXSD is a data model defining exchange formats for basic bioinformatics types of data: sequences, alignments, feature records with associated data and metadata. BioXSD aims to serve as a common, canonical tree-structured format (XML, JSON, YAML, binary) for the basic bioinformatics data. Specialised standard XML-schema formats such as for example SBML, MAGE-ML, GCDML, PDBML, PSI MI MIF, PhyloXML or NeXML are orthogonal efforts and should be used wherever applicable. BioXSD aims at filling the gap between these specialised XML formats. A canonical data format does not mean "the only format", but an exchange format that can be common to several tools (as one of multiple formats the tools are supporting). Tools can produce and consume BioXSD directly, or BioXSD can be used as an intermediate canonical format, rich enough to enable conversions among diverse formats. Using common exchange format enables smooth integration of compatible tools into analysis workflows. BioXSD is a rich but not too complicated data model and exchange format, aiming to enable deployment of globally and smoothly interoperable bioinformatics tools on the World Wide Web of Services. BioXSD supports HTTP ("REST") Web services and WS-I compliant SOAP Web services, and interoperates with ordinary HTTP (REST), SOAP, and XML libraries for common programming languages. No other infrastructure than standard HTTP and XML is necessary for using BioXSD-compatible Web services. In the near future, we would like to add smooth support for JSON, YAML, and eventually other data-serialisation languages, as alternatives to using BioXSD in XML. BioXSD is a "blue-collar" initiative originating from the inside of the bioinformatics community, initiated among others by the EMBRACE project partners and the participants of the 1st DBCLS BioHackathon, in 2008. BioXSD data-type definitions are annotated with EDAM and with a few main Semantic-Web vocabularies. BioXSD thus offers ready-made building blocks for tool interfaces with a globally defined, controlled meaning (semantics). BioXSD has been developed by analysing existing requirements, tools, Web services, data formats, and ontologies. Feasibility was tested at different pilot providers, using diverse libraries and programming languages. BioXSD types can be used directly if applicable; or can be included in other standard or custom types, extended or restricted. With tools that use other or proprietary formats, BioXSD can be used as a canonical intermediate exchange format. Open collaboration within the community: BioXSD welcomes feature requests, suggestions, and new collaborations! To submit your proposals, suggestions and requirements, please post an issue at http://github.com/bioxsd/bioxsd, or post to a new or existing topic at http://groups.google.com/group/bioxsd, or write to developers@bioxsd.org. Please see contact details. Kalaš, M., Puntervoll, P., Joseph, A., Bartaševičiūtė (now Karosiene), E., Töpfer, A., Venkataraman, P., Pettifer, S., Bryne, J.C., Ison, J., Blanchet, C., Rapacki, K. and Jonassen, I. (2010). BioXSD: the common data-exchange format for everyday bioinformatics web services. Bioinformatics, 26, i540-i546. Gundersen, S., Kalaš, M., Abul, O., Frigessi, A., Hovig, E. and Sandve, G.K. (2011). Identifying elemental genomic track types and representing them uniformly. BMC Bioinformatics, 212, 494. BioXSD 1.1 has been developed hand-in-hand with GTrack, the unifying tabular format for sequence/genome features. Both formats use the same tactics for optimising size of diverse kinds of feature records, via flexible options for recording features' positions and other data. BioXSD 1.1 (namespace http://bioxsd.org/BioXSD-1.1) is available at http://bioxsd.org/BioXSD-1.1.xsd. This latest stable version is available for implementations, actively maintained, and open to further developments. New requirements and suggestions for changes are welcome and may be reflected in future versions. or to be synchronised with its future releases in case of publishing custom-annotated or custom-modified BioXSDs. Older BioXSD 1.0 (namespace http://bioxsd.org/BioXSD-1.0) is available at http://bioxsd.org/BioXSD-1.0.xsd. The source files and releases of the BioXSD schema, of supportive utility software, and of documentation are in transition to http://github.com/bioxsd/bioxsd, and will gradually appear there. BioXSD data models and schemata are licensed under a Creative Commons Attribution-ShareAlike 4.0 International License (CC BY-SA 4.0). Please note also the Code of Conduct for derived work, outlined at the top of the http://bioxsd.org/BioXSD-1.1.xsd file. For release information including CHANGELOG, please refer to the bottom of the XSD files. A concise quick overview guide to the BioXSD format is at ./QuickReference. Full reference documentation of BioXSD version 1.1 is at ./technicalDocumentation/BioXSD-1.1. Documentation of BioXSD version 1.0 is available at ./technicalDocumentation/BioXSD-1.0. A UniProt accession as a BioXSD 1.1 element - a toy example of an "inline" instance of a simple type. A BioXSD 1.1 sequence record is an example "inline" instance of a complex type: in XML, BioJSON, and BioYAML. Examples of feature data represented in BioXSD 1.1 format. Examples of diverse types of bioinformatics data represented in the older BioXSD 1.0 format are available in the referred example file. The example file contains numerous examples of sequence records, annotated sequences, and multiple-sequence alignments. 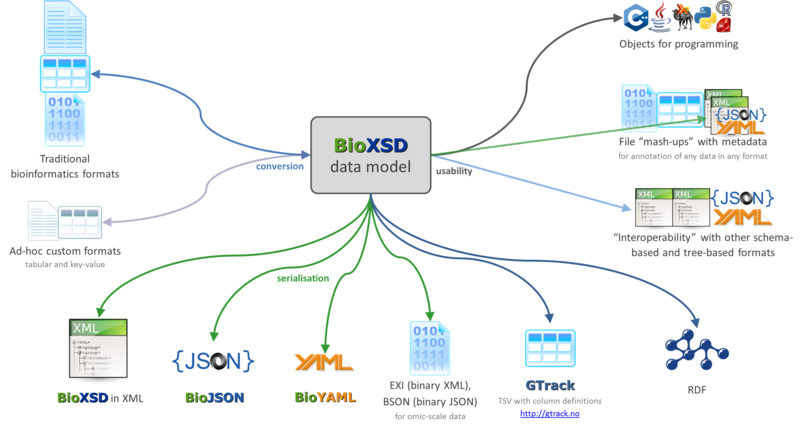 Example workflows (analysis pipelines) combine multiple bioinformatics Web services using BioXSD. Workflows show that such services are smoothly compatible. If you started using BioXSD for your software, services, libraries, or other tools, please let us know by sending an email to support@bioxsd.org. For maintenance and support purposes we would love to know about the providers using BioXSD. A registration system may become available in the future. Volunteers are also always welcome to contribute by joining the 50 BioXSD|BioJSON|BioYAML-compatible tools or services challenge. Contributions in all forms are warmly welcome and needed! BioXSD was developed as part of multiple collaborative projects. There has never been any funding directed exclusively to BioXSD. The current developments of BioXSD|BioJSON|BioYAML are done together with the developemnts of GTrack|BTrack|GSuite, as a BioXSD|GTrack service provided by ELIXIR Norway. Please feel free to post and communicate in any language. We will do our best to understand.